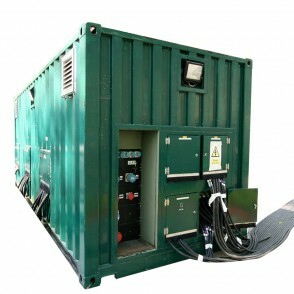 Powerline’s mains room is a large, 3 phase distribution unit built into a 20ft ISO shipping container. It has the facility to accept up to 4800A of three phase power (across three 1600A incoming supplies) and can distribute this into twelve separate 400A, three phase outgoing supplies, each with individual protection. It has a selection of single and three phase outlets, and full, real-time monitoring of the three incoming supplies is provided by state-of-the-art digital power meters. Inside, the unit is equipped with lighting, and 13A sockets, giving it a dual purpose as a secure site office. The mains room has been the power hub for many large televised sporting events including the broadcast compounds for the Open Golf Championship (2004-), UEFA Champions League Finals at Wembley () and Manchester, and all venues of the Ryder Cup in the British Isles since 2002 – including the K. Club (co. Kildare, Ireland, 2006). However, the mains room’s crowning glory was the provision of power to the world’s media for the wedding of Prince William and Catherine Middleton (2011) – an event watched by 24.5 million people in 180 countries.